Located in Fanari, overlooking the Aegean Archipelago. Mykonos Town is 5 km from the villa, the closest shop is 3 km, and the airport is 7 ½ km away. For those wanting access to the beach, Agios Stephanos is 3 km away. 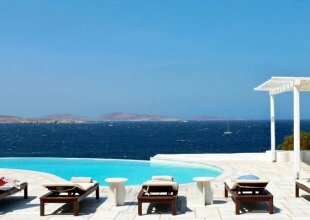 Located uphill in a unique wind-sheltered position in the Fanari area, The Eagle's Nest enjoys one of the most panoramic and beautiful views of Mykonos. It overlooks the Aegean archipelago including the island of Tinos, Syros and Delos with its magical sunset. The property is spread over different natural terraces connected by several stone paths consisting of three buildings: the main house and two separate guesthouses. The style and feel of this property is special as it combines a typical Cycladic architecture with some country house Provencal style giving this property a unique charm and remarkable appeal. The main entrance of the house leads directly to a beautiful open plan and country style fully equipped kitchen, while the living room is bright and cozy with stunning sea views. Two beautiful detached two-level guesthouses, complete the property. One is located below the pool and main patio, while the second with kitchenette is located above the main villa and next to the property's tiny private chapel. Upon request for extra guests, an additional Garden Suite with sea views is located above the main house. The Eagle's Nest is a very rare and exceptionally charming house offering pleasure to the eyes and soul to the most demanding clientele. ● Guest Bedroom with double bed, A/C, en-suite bathroom with shower, kitchenette, small living room, direct access to private terrace, sea view, outdoor dining setting.